The Omega Swiss Watch Company has a storied history dating back to 1848. By 1918 Omega was supplying watches to both the British Air Force and the American Army. In 1947, Omega created the first tourbillon wristwatch calibre in the world with the 30I. NASA chose the Omega Speedmaster Professional wristwatch as the official timepiece that Apollo 11 astronaut Buzz Aldrin would wear as he walked on the moon. The James Bond 007 film franchise has also embraced Omega and featured the waterproof Seamaster Planet Ocean and Seamaster Aqua Terra Automatic watches in their movies. Omega Watches are the official timekeepers of the modern day Olympics and have also issued a watch designed for the America’s Cup Sailing event. In 2013 Omega announced the creation of the world's first movement that is resistant to magnetic fields greater than 1.5 tesla (15,000 gauss), far exceeding the levels of magnetic resistance achieved by any previous movement. 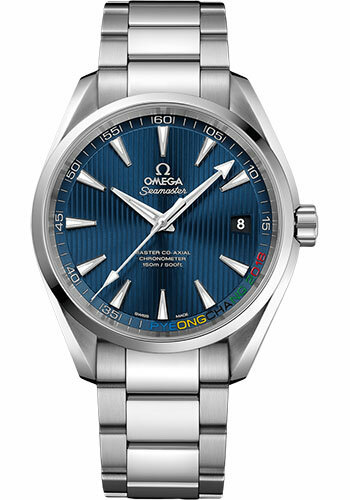 Omegas brand ambassadors are seen wearing such popular styles as the De Ville Co-Axial Chronometer, Constellation watch, Speedmaster Moonwatch, Seamaster Diver, Skywalker, and include: Cindy Crawford, Nicole Kidman, Jacques Cousteau, George Clooney, Michael Phelps, Rory McIlroy, and Daniel Craig. The Omega Watch Company is owned by the Swatch Group and manufacturers their timepieces in Biel Bienne, Switzerland. At SwissLuxury.Com we enjoy selling authentic Omega watches at discount prices and feel that this is a brand that makes stunning timepieces at reasonable price levels.